Business Franchise is the magazine of choice for the UK franchise industry. It is the official publication of the British Franchise Association (bfa) and incorporates the Show Guide for all bfa-supported Franchise Exhibitions throughout the year. Business Franchise provides a lively mix of news, vital information and expert opinion on the pros and cons of running a franchise. In addition, the pages of Business Franchise focus on franchising as the safest method of starting your own business, inspiring thousands of serious entrepreneurs to contact the companies featured. It is available to buy at WHSmith and most reputable news agents. 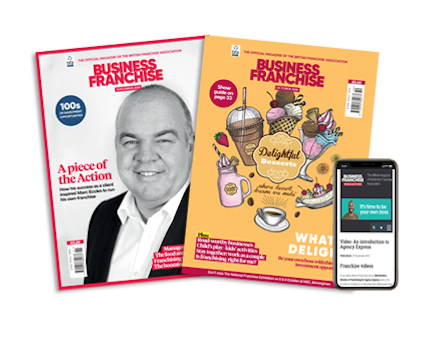 Advertisers in Business Franchise renew again and again – proving that the magazine provides the most effective market coverage and generates the most effective response. If you are serious about the business of franchising you need Business Franchise.